Follow this lively itinerary or make one of your own! 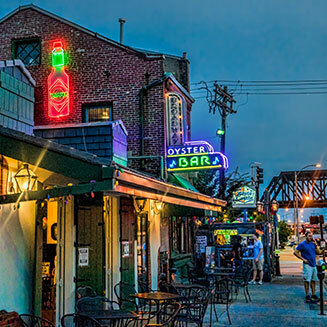 LGBTQ visitors in St. Louis for a getaway weekend will experience one of the nation’s most gay-friendly cities, filled with welcoming locals and great places to connect and immerse in this vibrant Midwestern culture. For visitors in St. Louis, during the last weekend in June, be sure to check out one of the Midwest’s largest PrideFest celebrations! 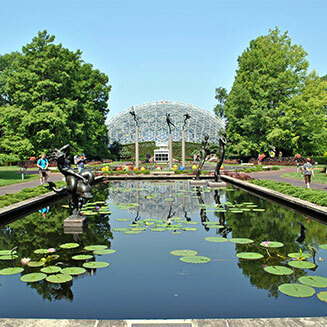 Check into your hotel this afternoon and head for the Saint Louis Art Museum, one of St. Louis’ free-admission attractions in gorgeous Forest Park. Craving showbiz? At The Muny, the park’s 100-year-old outdoor theatre, size matters—it’s the biggest in the country and presents a summer season filled with classic American musicals, from campy to contemporary. Later tonight, stop by The Grove neighborhood. 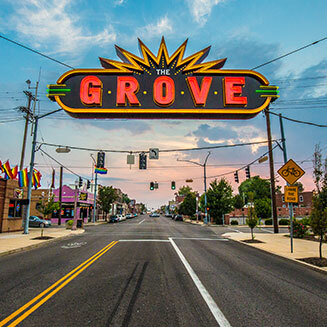 You’ll know you’ve arrived when you see the bright neon sign along Manchester and Tower Grove avenues. Enjoy a brew with buds at the Urban Chestnut Bierhall or stop in at one of the clubs. Start the day with a free yoga session at the Tower Grove Farmers’ Market, where you’ll also find a fine selection of fresh and prepared foods from local growers for breakfast. Want to meet more locals? This afternoon, spend some time in The Loop neighborhood just north of Forest Park and Washington University. Wander along the St. Louis Walk of Fame there to find brass stars and bios honoring world famous St. Louisans including playwright Tennessee Williams and film stars ranging from Betty Grable and Vincent Price to John Goodman and Kevin Kline. Check the concert schedule for the neighborhood’s music venues—The Pageant, Delmar Hall or Blueberry Hill—to see if the hip area should figure into your nighttime plans. Or, go to the Grand Center Arts and Entertainment District tonight to enjoy the best in touring Broadway shows at the fabulously ornate The Fabulous Fox Theatre. Later this evening, head just south of downtown and into where you can mingle to the soundtrack of authentic St. Louis Blues music. The intimate clubs, including BB’s Jazz, Blues and Soups, The Beale on Broadway, Broadway Oyster Bar and many other hot spots welcome all. Sentence yourself to late-night fun in the Soulard neighborhood’s The Bastille, a gay cub that gives a wink and a nod to St. Louis’ French heritage. Staying over until Monday? The Bastille’s Mighty Monday drag shows are a hit. Express yourself in St. Louis.